Calling it now it will be like the Kodo design where it was upgraded in same design with blank walls left and right. Lol but this I don't think will have blank walls just an ugly design. Why can't we have the sleek 100-199m designs I've seen approved in Melbourne? Or Brisbane? Or the GC? Or Sydney? Or anywher else in Ozzie? Yes it's exciting we are seeing new development but dam must it be so basic. Mpol wrote: Calling it now it will be like the Kodo design where it was upgraded in same design with blank walls left and right. Lol but this I don't think will have blank walls just an ugly design. Why can't we have the sleek 100-199m designs I've seen approved in Melbourne? Or Brisbane? Or the GC? Or Sydney? Or anywher else in Ozzie? Yes it's exciting we are seeing new development but dam must it be so basic. There is plenty of trash also going up in Melbourne, Sydney and so on. Not all Adelaide designs are basic either, case in point - Realm Adelaide. It has potential to be a stunning architecture masterpiece even by Australian standards. Sofitel Hotel will also be another sleek beauty. Great observation. At the original height (albeit not known at the time it was originally proposed) it would now barely be visible from the south once the Calvary Hospital (60m) is finished. At >90m it becomes much more obvious again and deserving of extra consideration of its appearance. Doesn't appear to have increased in height as previous posts suggested. A neat little proposal, appears to comes with a standard blank wall which seems to be all the rage at the moment. 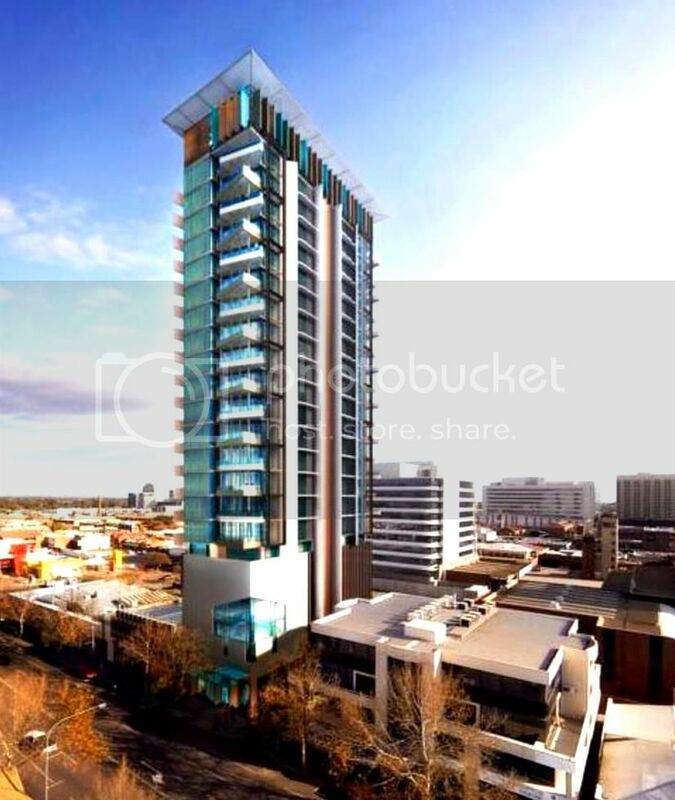 Don't know if Adelaide has the demand for all of these towers, i wish it did but time will tell! 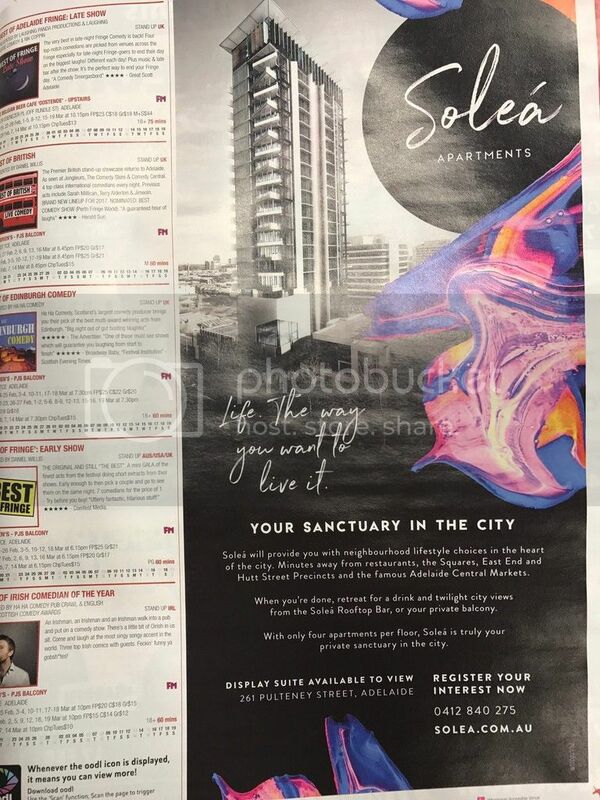 Pretty much a full page add in this years fringe guide. Probably a very good place to advertise. Not so long ago there were NO 30+ floor bldgs proposed - remember the 18 floor ceiling we had for decades. It's only been over about a year since these 30= floor proposals have come. The conviction of developers must say something about Adelaide here. WE will see many of them over time unless there is a recession/depression. Design could be better. Melbourne has some great buildings in the works. Not taking away from Auckland's late '90's building boom, and the money that attracted but... Auckland has lumpy hills, harbour and restricted land availability to deal with, whereas Adelaide is almost flat and has acres of land available. I find that the former lends itself to more interesting architecture for some reason. Designers seem to produce more interesting work when there are constrictions to work around. This looks cool! Really liking the vibrancy of the colours!